Under the coordination of UN-SPIDER, the mission team comprised nine experts from UN-SPIDER, the United Nations Economic and Social Commission for Asia and the Pacific (UNESCAP), USGS EROS Center, IEEE - Geoscience and Remote Sensing Society, Centre for Space Science Technology Education in Asia and Pacific (CSSTE-AP), Asia Pacific Space Cooperation, National Disaster Reduction Centre of China and Mekong Consultant Co Ltd, Laos PDR. The mission included meetings with the Relief and Resettlement Department and other national and international organizations. The mission also included a workshop on “Application of Space Technology for Disaster Risk Reduction” which was attended by more than 50 key officials representing the various ministries/departments of the Government of Myanmar, NGOs, Academia and private companies. During the mission, USGS handed over hard disks containing about 500 GB archives of satellite data covering Myanmar. These disks contain LANDSAT (medium resolution) satellite images of entire country and select coverage of ORBVIEW (high resolution) images. They also contains digital elevation models derived from ASTER (30 M resolution) and MODIS (90 M resolution). This data was made available to the key agencies such as Relief and Resettlement Department, Ministry of Science and Technology, Department of Water Resources Utilization, Department of Meteorology and Hydrology to address unmet needs of satellite data required for hazard mapping and risk assessment. The Relief and Resettlement Department (RRD) plays a central role for disaster risk management and emergency operations. RRD is responsible for disseminating information on natural disaster prevention, mitigation, preparedness, awareness raising and capacity building activities. RRD is also responsible for coordinating relief and rehabilitating operations undertaken by UN agencies and NGOs. 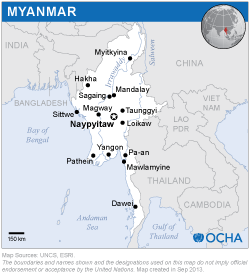 In recent years, Myanmar focused on efforts on disaster-risk reduction. The Myanmar Action Plan for Disaster Risk Reduction (MAPDRR) lists a large number of activities which require up-to-date hazard, and risk assessments derived from space applications and ground-based data. Considerable base-line data/maps are available with various Ministries and Departments of the Myanmar Government. However, the mission also took note of a coordination gap that exists among government agencies in the context of both disaster-risk reduction and emergency response efforts. In addition, compartmentalization of data with various Departments and Ministries is major constraint that needs to be addressed. In the context of access to and use of space-based information, the Department of Meteorology and Hydrology (DMH), the Forest Department, the Ministry of Science and Technology and the Remote sensing department of the Mandalay Technological University have the best capacity. The DMH routinely accesses data from meteorological satellites. The Forest Department carries out landuse and landcover mapping of the entire country. The remote sensing archives in the department include Landsat and LISS II coverage. The most recently added imagery to the archive are the IRS LISS III images of the entire country acquired in 2010. Besides, DMH has procured QuickBird, IKONOS and ALOS images of specific areas. NOAA images are regularly used to monitor forest fire. However other government agencies lack the capacity to use space-based information or maps obtained from other sources such as the International Charter: Space and Major Disasters and Sentinel Asia. There are no national standards regarding Geographical Information Systems. However, the Forest Department has developed its own standards for internal use and follows the Metadata standards provided by the International Centre for Integrated Mountain Development (ICIMOD). The mission took note of the gap that exists in making spatial data (baseline data, thematic mapping, infrastructure atlas etc.) available to Ministries. As a result, every Ministry or Department has to create its own GIS database based on the paper maps purchased from the Survey Department. This creates challenges in data sharing as data standards and formats do not match and many organizations carry out a duplication of efforts. The mission therefore took note of the fact that different organizations are working with different standards when it comes to geospatial data and information. The country needs to develop the infrastructure to provide the capability to download data quickly for emergency response requirements. This implies upgrading the current internet capabilities, the provision of hardware to use satellite delivery capabilities and upgrades to the existing telecommunications networks.